The holiday spirit hit me so hard this year. How do you describe the Christmas feeling? Holiday music, drinking a Keto Eggnog drink, and comfy fluffy pajamas are all I want these days. There is something magical in the air that makes me cherish all the people and good things that happened the last year. The month of December is about reflection on our blessings and finding ways to bring happiness for those around us. There are 16 days until that wonderful time, and I already hang strings of Christmas lights everywhere. I love decorating the Christmas tree, making DIY decorations and finding gifts for the very loved ones. I grew up drinking thick, creamy and so fluffy eggnog. Eggnog is usually made with whole milk, cream, whipped egg whites, egg yolks, sugar, cinnamon, and nutmeg. The adult version can contain some alcohol like brandy, rum or bourbon. Traditionally consumed around Christmas time in the United States and Canada, eggnog has gain popularity among Australia’s people too. I love eggnog, but I have friends that hate it. It seems that there’s no middle ground on eggnog. You either like it or hate it. 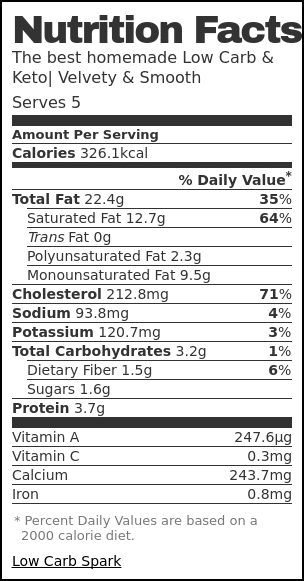 I was surprised to find out, the eggnog we buy in a carton from the stores does not contain fresh egg. 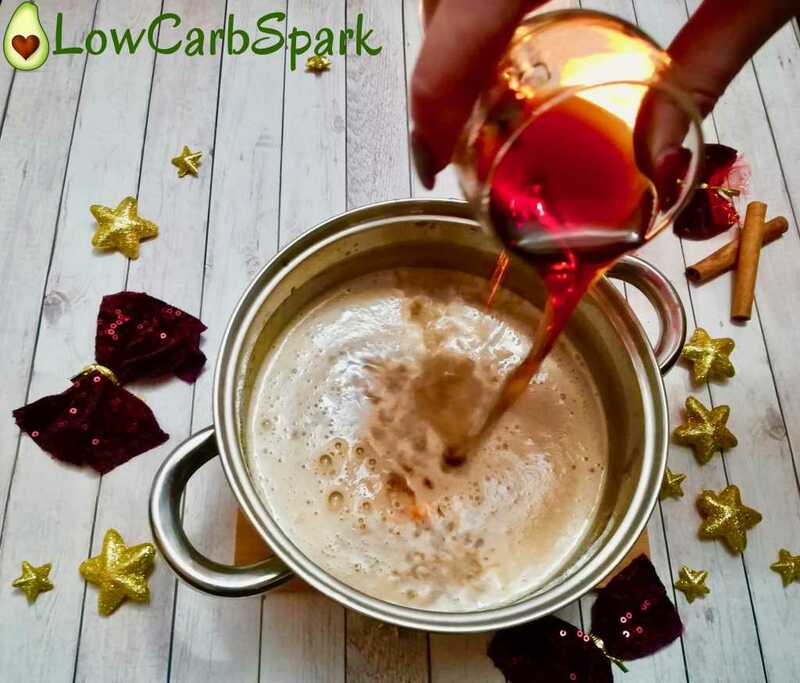 To start preparing this unique drink, we will need to switch some of the ingredients in the original recipe to make it low carb. 1 teaspoon freshly grated nutmeg – for extra flavor. You can choose from Rum, Dark Rum, Brandy. Dark liquor has zero carbohydrates. It is perfect to drink on a ketogenic diet. Add all the ingredients in a blender. Pulse for 20-30 seconds, and it’s ready to serve. It is definitely not as frothy and creamy as the classic recipe but is mess-free. Let it sit in the fridge for 1 hour and feel the holidays vibe. 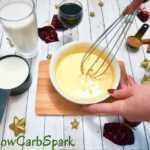 This is my favorite method of making eggnog because it’s creamy and the risk of foodborne illness is reduced. Eating raw eggs can increase the risk of Salmonella. If you decide to use raw eggs, make sure you get the pasteurized eggs from the store. You can pasteurize eggs at home, but the process is pretty time consuming, I don’t want to bore you with it. 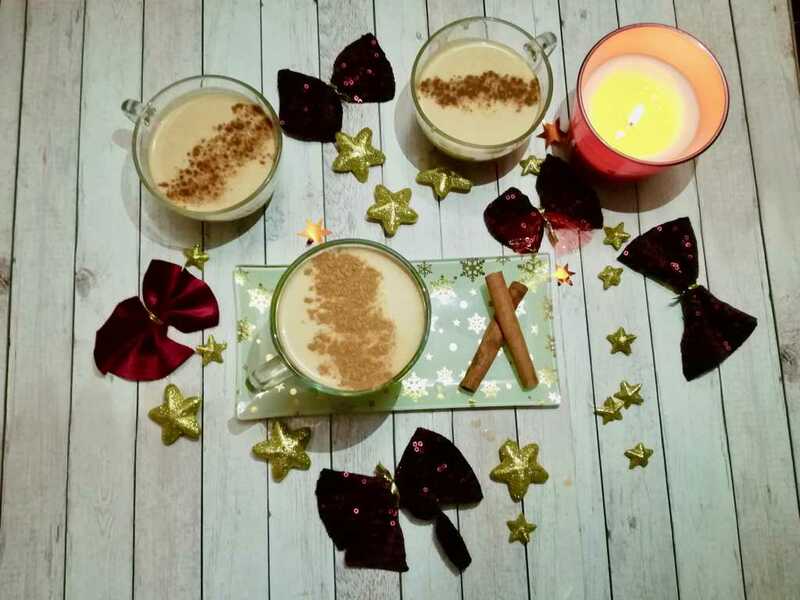 Follow the recipe steps described below to make the cooked version of eggnog. In a medium mixing bowl, beat the egg whites to soft peaks. Gradually whisk the egg whites into the chilled mixture. I am not a big fan of this recipe because to me it tastes like undone ice-cream. 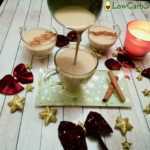 For an alcohol-free low carb eggnog recipe, just remove the booze and replace it with rum extract and add low carb milk instead. 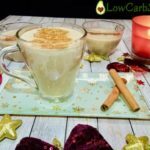 You will love keto Eggnog with a twist. 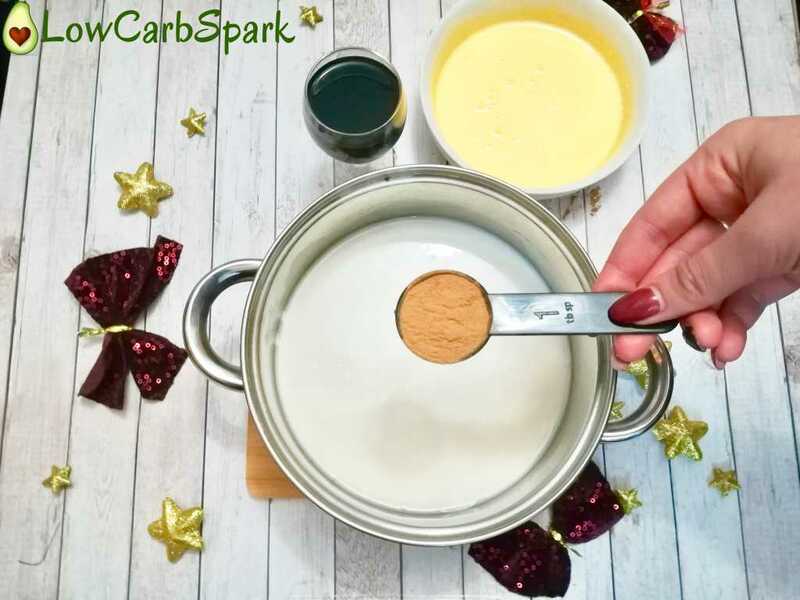 Just mix 1/2 bar melted super dark keto friendly dark chocolate into the liquids and then, add two tablespoons of high-quality cocoa powder to the egg yolks. Then just follow the steps as shown below. 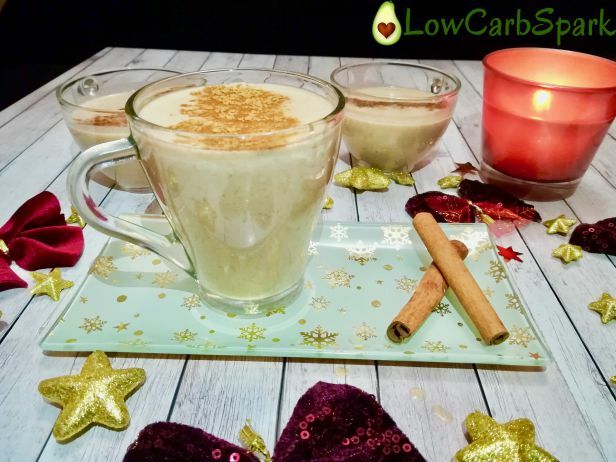 A special keto drink that is velvety & smooth to enjoy during the Winter Holidays. In a bowl add the egg yolks and mix until they have a lighter color. Gradually add the sweetener and continue to whisk until completely dissolved. 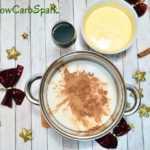 In a medium saucepan, over high heat, combine the almond/ coconut milk, heavy cream, nutmeg, cinnamon. Bring to a boil and stir occasionally. Remove it from the heat, and slowly incorporate the eggs into the hot spicy milk. Whisk constantly to avoid the egg curdle. Stir in the vanilla extract and the alcohol of your choice (dark rum). Pour into a medium mixing bowl, and let it in the refrigerator to chill for at least an hour. 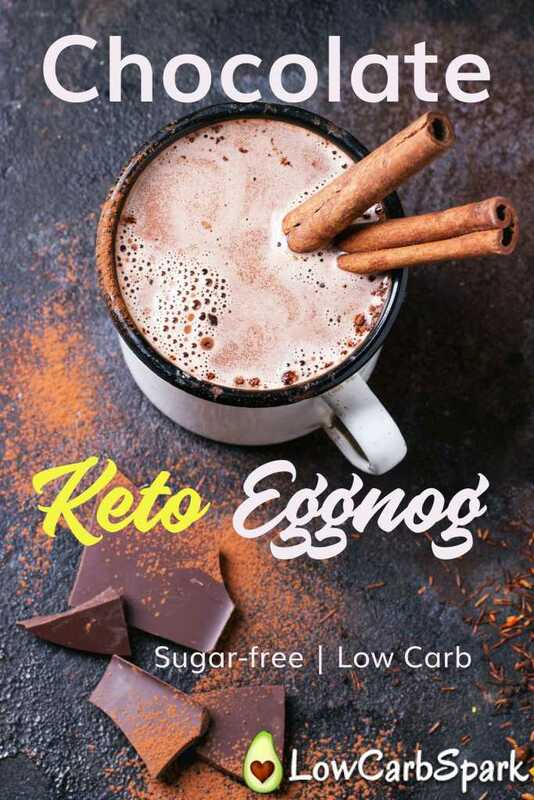 If you want a keto dairy free eggnog option you can use sugar-free coconut cream instead of heavy cream. You can also add rum extract instead, to make it alcohol-free. What do you love to drink waiting for Santa? When do you add the egg? 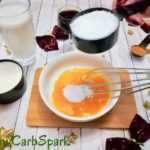 There is mention of adding all engredients except egg yolk or egg whites. Or do you add both. Thanks so much! Can’t wait to try it.